With a different plot, this could be a great story. The third and final installment of the London’s Greatest Lovers trilogy features Ainsley, the youngest but highest-titled brother of the three heroes in the series. In the previous books, Ainsley is the admirable and responsible brother. 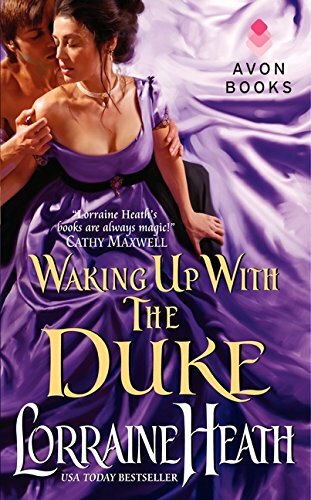 But his agreement to his cousin’s odious request to impregnate his wife makes him much less so in Waking Up with the Duke. Ainsley’s cousin Walfort was paralyzed in a curricle accident in which Ainsley had been driving. His injuries prevent him from siring the children his devoted wife so desperately wants. Walfort wants to give his self-sacrificing wife the gift of a child, and since artificial insemination was quite a few years away from being an option, he asked Ainsley to help out the old-fashioned way. Initially appalled at the idea of being asked by her husband to commit adultery, not to mention being sent away for a month like a broodmare, Jayne ends up acquiescing to the idea because not only does she really, really want a child, but she thinks her husband does as well. Obviously, Ainsley and Jayne’s reluctance to accept Walfort’s proposal is supposed to make it more palatable for readers. Their initial guilt and contrition, their assertion that they’re doing it to make amends or to assuage guilt, all of this is supposed to make their sordid affair acceptable. Some readers will be able to accept the plot and the author’s attempts to excuse, explain, and justify the hero and heroine’s adulterous affair. Those readers will thoroughly enjoy the story, which is teeming with passion and steam and the love-of-a-lifetime-is-doomed tension that results in a dramatic happy ending. It’s also well written with well-developed characters. But others won’t be able to shake the lingering disappointment that Ainsley and Jayne, the cousin’s wife and the Duke’s love interest, are engaged in a distasteful plot. Even if they do agree to copulate out of guilt. Even if they do loathe the idea, at least initially. Even if they do it with selfless and gallant intentions. Ainsley and Jayne seclude themselves for a month. During that time not only does she “get with child,” but they also fall in love. Obviously, both believe their love is doomed to go unconsummated—well, no longer consummated. But as readers know, love always finds a way in romance novels. Even if it does take an unfortunate route.